Sometimes you just don’t have the time or energy to play with your dog. It’s totally understandable, but it doesn’t stop us from being plagued by guilt about it — especially when we look into those sad puppy-dog eyes looking up at us pleadingly for a little attention beyond a pat on the head. Dogs need exercise, and when they don’t get it they can turn into real pests or, worse yet, become destructive. That’s why it’s important to ensure that your dog is walked regularly and has other outlets for expending all that enthusiasm. Interactive toys such as fetching machines can be the answer. Playing fetch is the favorite past time of most dogs and a great way to alleviate boredom. They will run themselves ragged chasing after a stick, ball or even a rock. It makes no difference to them. As long as you’re willing to throw it, chances are they’re willing to fetch it. But not everybody’s a Nolan Ryan or Roger Clemens, and your pitching arm can wear out pretty fast. Handheld ball launchers like those ChuckIt sticks can help you throw a ball farther and alleviate a lot of the wear and tear on your shoulder, but self-fetching dog toys that are automated can put you back in the dugout and take you out of the equation altogether once your pitching days (or minutes) are over. Currently, there are several different brands on the market to choose from when it comes to automatic ball throwers. One of them is called iFetch. It’s a sturdy, automated ball-fetching machine that comes in two models. 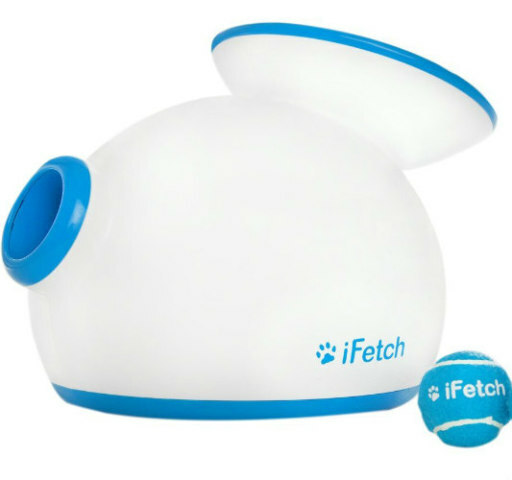 The original iFetch is better suited for medium to small dogs, as the balls it shoots out are only 1.5” in diameter, perfect for smaller mouths. 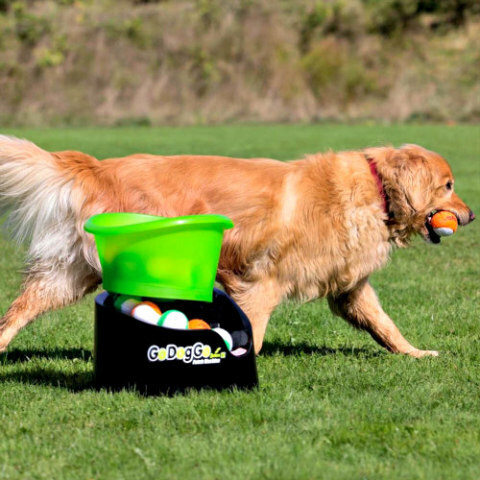 The iFetch Too is designed for larger breeds that have no problem handling full-size tennis balls. Both models come with three balls and have received positive reviews from pet owners on sites like Amazon, where they can be purchased. 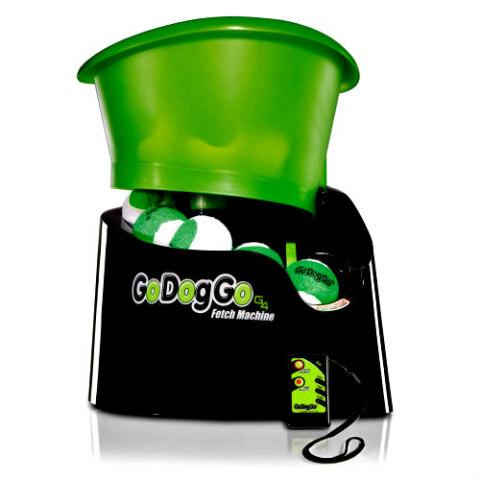 The GoDogGo self fetcher claims to be the worlds' first fetch machine and the “Original Award Winning Automatic Ball Thrower for Dogs since 1999.” The product features three time settings for launching at 4-, 7- and 15-second intervals in addition to three distance settings. The cool thing with GoDogGo is the safety arc feature that launches the ball upward and out to ensure your dog doesn’t take one straight to the kisser. The last thing you need is a vet bill from your dog being hit in the eye. The versatile product works with various ball sizes and styles, so you’re not locked into any one brand of balls and it can be used with multiple dogs. Interactive toys or what are sometimes called science toys are a great way to maintain your dog’s mental and physical health. They keep pets engaged and demand a certain level of mental acuity. If your dog picks up on training like a duck to water, you should have no problem teaching them how to use a self-fetching machine. Like teaching an animal to use a pet door, it should only take a few times before they’ve got it. There’s not much to it: drop the ball in, it shoots out. If you still have your doubts as to whether or not your pet would like it, there’s a video that’s been circulating recently of one uber enthusiastic pup named Buddy playing with his you can check out below.